So, I’m pretty good at solving most technical difficulties. And, like most I turn to Google and have done a pretty extensive search. However, here are so many forums out there, I don’t know where to post it, so, I’m hoping that I can get some assistance here. I am running Windows 7. I have an external portable hard drive from Transcend (500 GB). I also have a Western Digital external hard drive (2 TB). I’m quite sure that none of this is hardware related, but could be handled through disk management. I’ve done something to the smaller drive and don’t know how to reverse it. There are no partitions on either drive. Disk 0 is the drive in question. Disk 1 is the internal and Disk 2 is the working external drive. The problem is that the capacity (not the partition) is stated incorrectly. I honestly don’t remember what I did, but I was essentially trying to start from scratch and format the drive. Some how, it’s stating that the size of the drive is approximately 500 MB not the actual 500 GB. I’ve tried taking it offline, but that doesn’t do anything. 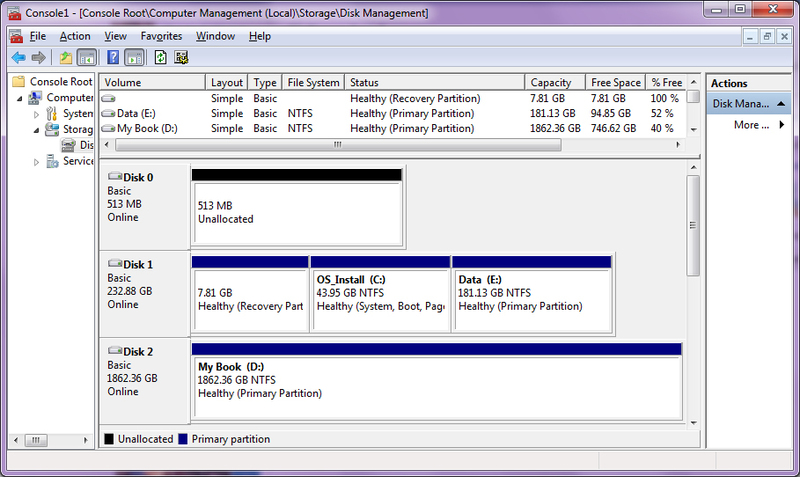 I’ve tried making it a healthy partition, but that won’t work either. Extending only works with partitions upto the maximum capacity. What happens when the capacity is wrong? Would love to hear any suggestions on how I can reset this. UPDATE: I finally took the drive in to get looked at since I can’t get it to even load. It turns out that something has mechanically gone wrong with it so it is getting replaced for a small fee. Never did figure this one out. If you’ve ever had to call a technical support or help desk line for your computer, raise your hand…I thought so. Almost everyone. Most of you have at one time or another have had to make such a call for a computer either at work or at home. One thing that not only helps the people supporting you, but also is great tool for gathering info for you to refer to in a second is the Print Screen button (PrtScrn) in Windows environments. It’s fast and easy to use, and you don’t have to install anything. What could be better? When I worked on a help desk and I was unable to connect to a client’s computer, I would have them do a screen capture using this key and then put it into a document and send it to me. Keep in mind, this wasn’t always possible, but at least in some cases, I could then see what the client was seeing, even if it was delayed. Set up your screen the way you want it, i.e., with everything in the place you need it. Press the PrtScrn button on your keyboard. This saves a screenshot image to your clipboard. Now open a program that can hold an image. I usually suggest Microsoft Word since most users that I deal with have it. Then simply use the “Paste” command. Save the file and send it off. This feature will capture the entire screen. But what if you don’t want everything? What if you only want to capture the active window? Click on the window that you want to capture and then use ALT + PRTSCN. This will just copy that window or dialogue box, which is great for error messages. I was surprised how many students that I deal with at my university don’t know how to use this wonderful feature, so forgive me if you already know how to use this.